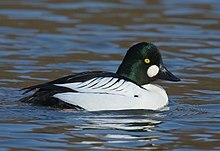 The common goldeneye (Bucephala clangula) is a medium-sized sea duck of the genus Bucephala, the goldeneyes. Its closest relative is the similar Barrow's goldeneye. The genus name is derived from the Ancient Greek boukephalos ("bullheaded", from bous, "bull " and kephale, "head"), a reference to the bulbous head shape of the bufflehead. The species name is derived from the Latin clangere ("to resound"). Common goldeneyes are aggressive and territorial ducks, and have elaborate courtship displays. Adult males ranges from 45–51 cm (18–20 in) and weigh approximately 1,000 g (2.2 lb), while females range from 40–50 cm (16–20 in) and weigh approximately 800 g (1.8 lb). The species is named for its golden-yellow eye. Adult males have a dark head with a greenish gloss and a circular white patch below the eye, a dark back and a white neck and belly. Adult females have a brown head and a mostly grey body. Their legs and feet are orange-yellow. Their breeding habitat is the taiga. They are found in the lakes and rivers of boreal forests across Canada and the northern United States, Scandinavia, the Baltic States, and northern Russia. They are migratory and most winter in protected coastal waters or open inland waters at more temperate latitudes. Naturally, they nest in cavities in large trees, where they return year after year, though they will readily use nest boxes as well. Natural tree cavities chosen for nest sites include those made by broken limbs and those made by large woodpeckers, specifically pileated woodpeckers or black woodpeckers. Average egg size is a breadth of 42.6–44.0 mm (1.68–1.73 in), a length of 58.1–60.6 mm (2.29–2.39 in) and a weight of 61.2–66.6 g (2.16–2.35 oz). The incubation period ranges from 28 to 32 days. The female does all the incubating and is abandoned by the male about 1 to 2 weeks into incubation. The young remain in the nest for about 24–36 hours. Brood parasitism is quite common with other common goldeneyes, and occurs less frequently with other duck species. The broods commonly start to mix with other females' broods as they become more independent or are abandoned by their mothers. Goldeneye young have been known to be competitively killed by other goldeneye mothers, common loons and red-necked grebes. The young are capable of flight at 55–65 days of age. Common goldeneyes are diving birds that forage underwater. Year-round, about 32% of their prey is crustaceans, 28% is aquatic insects and 10% is molluscs. Insects are the predominant prey while nesting and crustaceans are the predominant prey during migration and winter. Locally, fish eggs and aquatic plants can be important foods. They themselves may fall prey to various hawks, owls and eagles, while females and their broods have been preyed upon by bears (Ursus spp. ), various weasels (Mustela spp. ), mink (Mustela vison), raccoons (Procyon lotor) and even northern flickers (Colaptes auratus) and red squirrels (Tamiasciurus husonicus). The common goldeneye is one of the species to which the Agreement on the Conservation of African-Eurasian Migratory Waterbirds (AEWA) applies. Approximately 188,300 common goldeneyes were killed annually by duck hunters in North America during the 1970s, representing slightly less than 4% of the total waterfowl killed in Canada during that period, and less than 1% of the total waterfowl killed in the US. Both the breeding and winter habitat of these birds has been degraded by clearance and pollution. However, the common goldeneye in North America is known to derive short-term benefits from lake acidification. ^ BirdLife International (2012). "Bucephala clangula". IUCN Red List of Threatened Species. Version 2013.2. International Union for Conservation of Nature. Retrieved 26 November 2013. ^ a b c d e f Eadie, J. M.; Mallory, M. L.; Lumsden, H. G. (1995). "Common Goldeneye (Bucephala clangula)". The Birds of North America Online. doi:10.2173/bna.170. ^ Jobling, James A (2010). The Helm Dictionary of Scientific Bird Names. London: Christopher Helm. pp. 79, 110. ISBN 978-1-4081-2501-4. ^ Dow, Hilary; Fredga, Sven (1985). "Selection of nest sites by a hole-nesting duck, the Goldeneye Bucephala clangula". Ibis. 127 (1): 16–30. doi:10.1111/j.1474-919x.1985.tb05034.x. ISSN 1474-919X. ^ Pöysä, H.; Pöysä, S. (2002-06-13). "Nest-site limitation and density dependence of reproductive output in the common goldeneye Bucephala clangula: implications for the management of cavity-nesting birds". Journal of Applied Ecology. 39 (3): 502–510. doi:10.1046/j.1365-2664.2002.00726.x. ISSN 1365-2664. ^ Baldassarre, Guy A. (2014). Ducks, Geese, and Swans of North America. JHU Press. ISBN 9781421407517. ^ Eriksson, Mats O. G.; Andersson, Malte (1982-03-01). "Nest parasitism and hatching success in a population of Goldeneyes Bucephala clangula". Bird Study. 29 (1): 49–54. doi:10.1080/00063658209476737. ISSN 0006-3657. ^ Eadie, John McA. ; Kehoe, F. Patrick; Nudds, Thomas D. (1988-08-01). "Pre-hatch and post-hatch brood amalgamation in North American Anatidae: a review of hypotheses". Canadian Journal of Zoology. 66 (8): 1709–1721. doi:10.1139/z88-247. ISSN 0008-4301. ^ Cottam, Clarence (April 1939). Food Habits of North American Diving Ducks (Report). Washington, D.C.: United States Department of Agriculture. ^ "Common Goldeneye Minnesota Conservation Summary" (PDF). Minnesota Audubon. 2014. Retrieved 23 July 2015. ^ Pöysä, Hannu; Rask, Martti; Nummi, Petri (1994). "Acidification and ecological interactions at higher trophic levels in small forest lakes: the perch and the common goldeneye". Annales Zoologici Fennici. 31 (4): 397–404. JSTOR 23735678. Wikimedia Commons has media related to Bucephala clangula. "Common goldeneye media". Internet Bird Collection. This page was last edited on 1 January 2019, at 16:15 (UTC).